JD Wetherspoon is rolling out craft keg beers across 200 pubs, with availability due from 1st October. 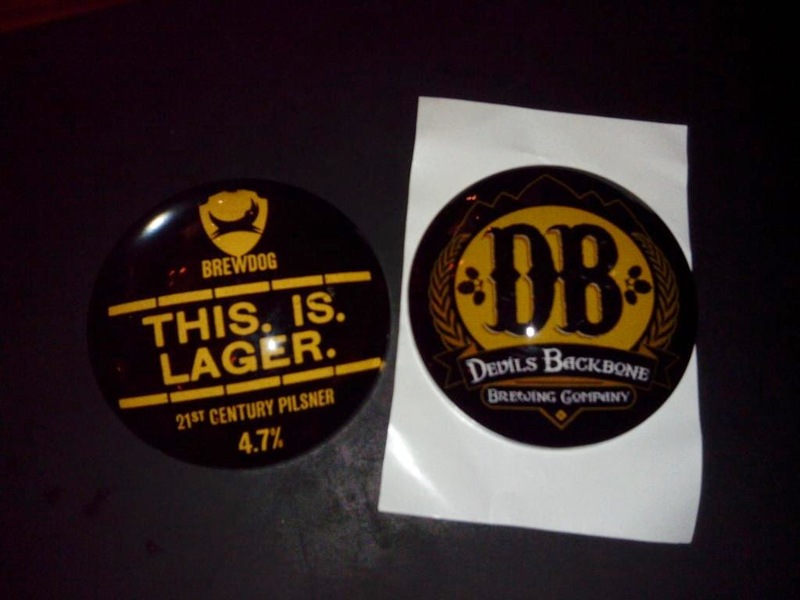 The first two beers on tap will be BrewDog's pretentiously named and pompously launched This.Is.Lager., while the other will be an American-style IPA from well regarded US brewer Devils Backbone, but contract brewed in the UK (so I hear) by Adnams. Here's the tap badges, aren't they dreadful? The DB one doesn't even tell you the beer name, never mind its style or strength. Still, I foresee local managers coming up with creative fixes for this. JDW will also be stocking Lagunitas IPA and Rogue American Amber in bottles, according to its Twitter account - presumably these will be the US-made versions. Apparently the Sixpoint beers are staying around, by the way. Interesting stuff. I wonder by how much they'll undercut BD's own prices in their own pubs? Also seems to undermine BD slightly, though they have to sell beer and JDW is good at that. Mike get more beer snobs into JDW too. Interesting stuff. I think Spoons already sells Punk IPA, but yes, it'll be interesting to see the pricing - ditto the new bottled beers. I just remembered - I think there was also something about the new beers being available as the drink with a meal, like the 6pt cans.